Oh how your child grows — fast! Don’t miss an inch with with artist Jessa ZG‘s brilliant Haute Height Chart. The modern and eco-friendly height chart is a fun and artful way to track your tot’s growth. Printed with non-toxic dyes on a 17″ X 57″ upholstery weight twill cloth, each chart comes with a non-toxic white fabric marker for recording growth spurts. The chart is available in either the ChromaPop rainbow pattern, or black and white. Oh how your child grows -- fast! Don't miss an inch with with artist Jessa ZG's brilliant Haute Height Chart. 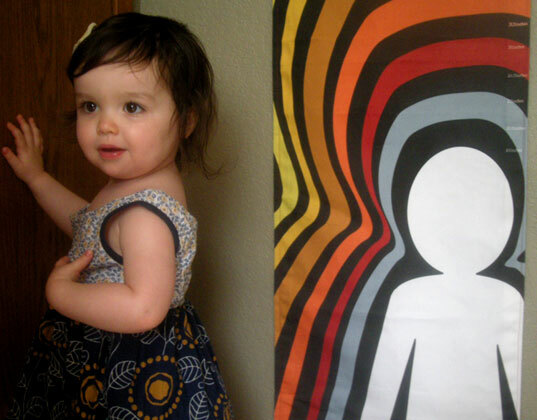 The modern and eco-friendly height chart is a fun and artful way to track your tot's growth. Printed with non-toxic dyes on a 17" X 57" upholstery weight twill cloth, each chart comes with a non-toxic white fabric marker for recording growth spurts. The chart is available in either the ChromaPop rainbow pattern, or black and white.